Three tools extend remote administration to the PocketPC. Any system administrator who's been stuck inside a windowless office on a nice summer day has dreamed of untethered administration. There's something seductive about the notion of managing your server farm while lounging on the beach and sipping some fruity drink. While most beaches don't have wireless access yet (and most sysadmins would get distracted if they did), untethered administration is fast becoming a reality. Take a handheld running the PocketPC 2002 operating system (such as the latest round of Compaq iPAQ or HP Jornada machines), add a wireless network card and an access point, and you can carry your login in your shirt pocket. Add one of the software packages from this review, and you can tap and click your way through many common network tasks without sitting down at a PC. For this review I looked at three contenders in the wireless admin market. Each has its own way of doing things, but they all work to help you manage your computers while roaming around. ProductivityNet's ActiveManage is designed to provide a flexible solution for remote administration of entire networks. For this review, I looked at a late beta of version 2.0, their first all-software release (version 1 depended on a dedicated rackmount server, which upped the price considerably). ActiveManage supports both browser-based and handheld clients (Palm and PocketPC), which extends its reach considerably. Administration is through a browser interface as well. Setup was easy; running the setup program on the server installs the ActiveManage software along with IIS sites for both Web and wireless connections. There's a second setup program that gives you the PocketPC user interface. That, too, installed without a hitch. You'll need an SSL certificate to configure secure connections to the server—and you'll definitely want to secure the server, as it can manage pretty much every aspect of your entire network. On the network site, ActiveManage employs an agent-based architecture that allows you to easily add more managed computers. Agents are available for Linux and Solaris servers as well as Windows servers and workstations. All connections from the handheld are made to the original ActiveManage server; from there, you can drill down into groups of servers and, ultimately, the server you want to manage. The PocketPC version of the software has its own user interface, optimized to cram information onto the small screen (see Figure 1). There's no command prompt as such, but you can execute commands on the server and view the output. 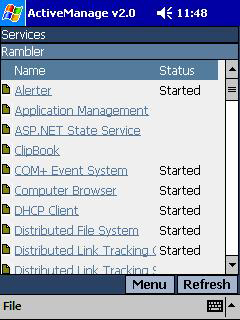 ActiveManage also supports its own system of alerts. You can choose, for example, to monitor whether a particular service is up. Alerts can be set up with automatic responses that range from restarting a service to notifying users to running a command. Other features include monitoring of system performance with history and browser-based remote control. ActiveManage works well, and has an impressive feature set. Though there are a few minor annoyances (notably the need to define users within ActiveManage, rather than re-using the ones you've already got in Active Directory), the result is a management tool that moves smoothly from browser to handheld to automated response system without a hitch. Expand Beyond has taken an approach to remote server administration that's likely to appeal most to sysadmins whose experience includes substantial work outside of the Windows GUI. That's because this is strictly a command-line tool. Rather than try to build a graphical interface with the options that they think you'll need, the PocketAdmin designers chose to deliver a server-side command line direct to the Pocket PC. Figure 2 shows a sample Expand Beyond session, here with the output from one of the command-line tools from www.sysinternals.com. Figure 2. PocketAdmin gives you a raw command line on the server, secured by SSH. Installing Expand Beyond was simple. There's a setup and configuration program to run on the server, which must be able to use SSH authentication (I used the freeware server from openssh.org for my testing). After that, you need to install the provided Jeode java virtual machine on the PocketPC. When that's done, you just copy the PocketAdmin client files to the PocketPC and launch the program. Fill in your server name or IP address, enter your username and password, and you're looking at a command prompt from the server. I ran into one minor problem—the program does not yet support SSH 2.0, and the error message was rather inscrutable; telling the server to use the older SSH 1.5 fixed this quickly—which technical support was able to solve easily. After that it was smooth sailing. The limited resolution of the PocketPC screen, of course, makes it necessary to choose your commands with care, but everything I tried worked well. That's not surprising, considering that this is basically a proxy for sitting at a local command prompt at the server. The PocketAdmin data sheet boasts such features as starting and stopping servers, viewing processes, and so on. That's all true, if you happen to know how to do those things from the command prompt. If you're used to the Windows GUI for management, you'll be lost here. Fortunately, there are many powerful command-line tools available these days. There's also VT-100 support, but there aren't a lot of VT-100 based tools out there. PocketAdmin does exactly what is promises: delivers a secure command shell directly to the PocketPC. 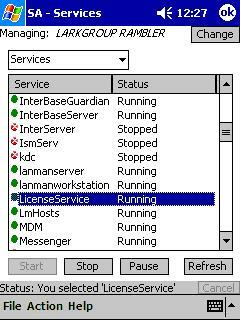 If you know what you're doing, that's enough to manage many aspects of Windows servers. Sonic Mobility's sonicadmin is a dedicated PocketPC client for managing Windows servers. It also includes a telnet client, so you can use it with any telnet device (such as a router) on your network. All operations move through a sonicadmin server on your network, which acts as a gateway to other devices. Installation consisted of running separate server and PocketPC setup programs. You'll need to customize ports and make a few other choices, but everything ran fine once I set them up. There are then some essential configuration tasks to perform on the server. You need to specify the servers to manage, the users who can manage them, and the handheld devices that they'll use. By default, nobody has privileges to do anything; you need to positively grant access to servers. You can then run the sonicadmin client on your Pocket PC, choose a sonicadmin server, and—assuming you can log in—start managing things. The client has dedicated screens for common activities such as managing services or processes. You can also get a remote command prompt or a separate telnet window. One nice touch is that the command prompt uses a tiny font so as to be able to fit more information on the screen. The sonicadmin application uses its own 256-bit encryption. This is completely transparent to the user and doesn't require any setup or external programs. In addition to the PocketPC, it also supports the HPC 720 and the RIM Blackberry as clients. Another nice feature is the pricing: if all you want is telnet access, the license fee is only $75 per server. This means you can add router and other device management for a minimal charge. Figure 3. Sonic Mobility has a clean user interface that brings the essential server information to your handheld. I worked with version 2.0, but 2.5 should be out by the time you read this. Promised new features include printer management, a file explorer, remote text editing, and user permission management. Sonic Mobility has also announced a partnership with Opalis, which will integrate the sonicadmin client with the OpalisRobot job management software. With its three-way command prompt, telnet, and GUI flexibility, sonicadmin is a good choice in the remote administration market. The improvements in version 2.5 make this one to watch.